President Obama’s “tour around China” and China’s response that “China is right here whether he (Obama) comes or not”1 reflect a delicate US-China estrangement. The China-Japan Diaoyu Island dispute is further complicated by Prime Minister Abe’s Yasukuni Shrine visit, fanning the flames of nationalism. Is geopolitics returning to Asia, or has it never gone away? Can Asian regionalism hold vis-a-vis the rise of a new round of great power rivalries in Asia? Is China a constructive contributor to Asian regionalism, or a divisive saboteur? This article argues that China is a constructive participant in Asian regionalism, though with its own characteristics. Since President Xi Jinping came to office at the end of 2012, China has been pushing through a new type of regionalism, i.e., building a wider Asian community based on infrastructure links and historical and cultural linkages. China’s regionalism in Asia started in the 1990s. At the fifteenth Chinese Communist Party Congress in 1997, President Jiang Zemin set the tone: “China needs to actively participate in multilateral diplomacy and give full play to China’s role in the United Nations and other international organizations.”2 In retrospect, China’s regionalism went through three major evolutions. First, China’s attitude towards regionalism evolved from “hostile” to “active.” In the 1960s, China was hostile to Asian regionalism represented by ASEAN, claiming that ASEAN was nothing but an anti-communist tool used by imperialists.3 In the late 1970s, and in particular after the end of the Cold War, China gradually changed its negative attitude towards ASEAN, and from the mid-1990s, China started to actively participate in Asian regionalism. Second, the geographic area, where China practiced its regionalism, has been significantly enlarged. Previously, China’s regionalism was confined to East Asia and now it has expanded to all directions in Asia, including Central and South Asia. In particular, China is now advancing its regionalism on two fronts: westward across the Eurasian continent, and southward towards the Indian Ocean. Third, China’s role in Asian regionalism has been transformed. When the People’s Republic of China was founded in 1949, China was playing a role as a revolutionary state, which refused to accept the regional arrangement dominated by the United States and its anti-communist allies. From the mid-1990s, China started to become an active participant and contributor to the existing regional mechanisms, and now China is transforming itself into a great power (China prefers to be called “a major country” instead of “a great power” in translating “daguo”) in Asia’s regionalism. China’s regional cooperation has experienced two stages. The first stage was characterized by economic and trade cooperation, aiming at building, in particular, a grand FTA with ASEAN, while the second stage, since Xi Jinping came to power, is characterized by a quest for building an Asian community based upon several key concepts including the community of common interest, the community of common destiny, the Silk Road Economic Belt and the Maritime Silk Road. It needs to be pointed out that these two stages are not entirely sequential. Instead, the two stages now overlap as China’s economic regionalism during Xi Jinping’s first term is featuring both FTA and community building. During the period from the 1990s through the 2000s, China was dedicated to regional integration characterized by negotiations on FTAs and other forms of cooperation. China’s regional economic cooperation was promoted extensively during this period. This was stage one with community building still not a prominent objective. Back in November 1991, the Chinese Mainland, together with Chinese Taipei and Chinese Hong Kong, joined APEC. It was the first time China responded to economic regionalism by agreeing to join, essentially inviting itself into a recently established association. Into the 1990s, China’s regionalism gave strategic priority to East Asian integration. At their first summit in 1997, China and ASEAN established a good neighbor and mutual trust partnership facing the twenty-first century. As agreed in 2002, China and ASEAN managed in 2010 to complete the China-ASEAN FTA (CAFTA), covering 1.9 billion people, USD 6 trillion in GDP, and USD 4.5 billion in trade. CAFTA is China’s first FTA and also the first FTA negotiated collectively by ASEAN. It represents a milestone in China’s regional cooperation. In 2001, the Shanghai Cooperation Organization (SCO) was established, representing a historical breakthrough in China’s regionalism and its neighborhood diplomacy. It was the first regional organization established on China’s own initiative. It shows that China’s neighborhood diplomacy had evolved into proactive institution building. In 2002, Chinese, Japanese, and Korean leaders proposed the ambitious idea of building a China-Japan-Korea free trade area (CJK FTA). On November 20, 2012, the economic ministers of these three countries announced the launch of CJK FTA negotiations in Cambodia. In December 2005, the East Asia Summit was launched, representing a new modality of Asian regional cooperation. This created an innovative platform for cooperation at a high level, encouraging North-South cooperation in East Asia linking rich and poor countries. In addition, China proactively participated in the regional cooperation in Southern Asia. In 2006, China formally became an observer to the South Asian Association for Regional Cooperation (SAARC), which includes India, Pakistan, Afghanistan, Bangladesh, Bhutan, Maldives, Nepal, and Sri Lanka. On February 26, 2011, the ministers of ASEAN countries discussed a proposal for negotiating a regional comprehensive economic partnership (RCEP) with other partners. At the end of August 2012, ASEAN, China, Japan, South Korea, India, Australia, and New Zealand agreed in principle to launch negotiations for RCEP. This is one more step toward multilateral economic cooperation, extending the record that China has compiled over more than two decades. The first stage in China’s pursuit of economic regionalism continues to go forward. Yet, as one looks at recent US efforts at regionalism, questions can be raised about a second stage in which economic ties are complemented by community-building ties. TPP is perceived in China as having more than economic objectives, and China’s response may be considered in that light. When China is actively participating in East Asian integration and advancing the SCO, the United States is returning to Asia. In 2008, the United States announced that it would join TPP negotiations, while China was still keeping some distance from them. Eventually, heated debate began within China about whether to join TPP. Part of the academic community believed that establishment of TPP would create significant trade diversion to the detriment of China’s interests, significantly reducing China’s exports and negatively affecting China’s economic growth. More importantly, the US-led TPP and the trans-Atlantic TTIP would probably dominate rules-setting in the world trading system, leaving China no other choice but to follow the United States and the European Union. That could further reduce China’s influence in the global trading system and delay China’s rise. Other Chinese scholars believe that TPP and TTIP could serve as external drivers, pressing the case for domestic reform and opening up. In both perspectives, China is advised not to be left on the sidelines as TPP advances. Despite expectations, China’s regionalism practices encountered difficulties from time to time. China’s relationships with neighboring countries are actually facing increased pressure. China is now seeing increased suspicion and fear from its neighboring countries, leading to incessant trade frictions and territorial disputes. As a result, regional cooperation has been negatively affected. These problems might be attributed to the following causes. First, the “China threat” theory is spreading. Neighboring countries’ fear of China is rising. China’s economic rise and the tremendous dividends that China reaped from regional cooperation and globalization, as argued by some Western politicians, cost opportunities to other countries, leading to resistance from them. China’s efforts at alleviating these misunderstandings were obviously insufficient. All of this has impeded China’s regional cooperation with its neighbors. Second, according to a Chinese proverb, “one mountain cannot accommodate two tigers.” There may be fierce competition for regional leadership. The United States wants to keep its leading role in the Asia-Pacific region through the so-called “Asia pivot.” Although the Chinese side repeatedly claims that the Pacific Ocean is wide enough to accommodate China and the United States,7 there is a lack of strategic mutual trust between the Chinese and American sides. Japan also wants to become the leading power in Asia and wants to lead Asian integration. Due to the remaining China-Japan historical and territorial disputes, the China-Japan relationship is on a downhill ride. These factors have serious negative impacts on the role of China in Asian integration. Third, China has territorial disputes lingering from history with neighboring countries, including Japan, Vietnam, and the Philippines. These disputes have intensified of late, as military standoffs have occurred. As exploring for oil and gas and looking for stocks of fish and other marine life have put crews in closer proximity, confrontations are occurring. The territorial disputes, thus, are moving into a new, dangerous stage. Despite all the challenges listed above, there are opportunities for China to expand regional cooperation. First, China’s reform and rapid economic growth as well as an ever-opening market have provided sufficient impetus to regional economic cooperation. Second, China’s performance in the Asian financial crisis has improved its image in Asia. Third, China’s proactive diplomacy in the SCO has given it rich experience for regional cooperation. Lastly, China’s good neighborly diplomacy has provided it with a political foothold for furthering its regional economic cooperation. Stage 2 of China’s Regionalism: Xi Jinping’s Regional Economic Diplomacy—a China Comeback? Since 2012, China has started to seek a community-building type of regional cooperation. It is characterized by efforts at deeper regional integration through calls for historical and cultural empathy among Asian neighbors. It is the very first time that China systematically seeks to integrate itself into the whole region by historical and cultural linkages rather than simply by means of economic links. First, China proposed the concept of the “community of common destiny” (CCD). At the annual conference of the Bo’ao Forum for Asia on April 7, 2013, Xi Jinping called upon Asian nations to firmly establish a sense of community of common destiny. On October 25, 2013, Xi delivered an important speech at a symposium on diplomatic work in China’s neighborhood and stressed: “strive for a good surrounding environment for our country’s development, push forward the development of our country that benefits neighboring countries more,” “seed community consciousness in neighboring countries,”9 China’s pursuit of building this community of common destiny has been reinforced by a series of diplomatic moves in Asia and in Africa. Second is calling for building the Silk Road Economic Belt as well as advancing the Maritime Silk Road. China in 2013 commemorated the 10th anniversary of the establishment of a strategic partnership between China and ASEAN. When Premier Li Keqiang visited the China-ASEAN Expo on September 4, 2013, he proposed establishing the Maritime Silk Road.10 When Xi gave a speech on April 1, 2014 during a visit to Europe, he even mentioned building a silk road linking the two ends of the Eurasian Continent.11 Using the ancient Chinese concepts of a land-based silk road and a maritime silk road, China has proposed a new model for its regional cooperation. Rediscovering these old concepts gives China renewed confidence in remolding its role in Asia. In parallel, China is advancing the new “morality-interest concept” (Yi and Li). “Yi” (“义”) can be used to express one’s personal loyalty and code of brotherhood to one’s friends and many other positive aspects in interpersonal relations, as well as in person-to-state relations. It is a kind of Chinese morality from ancient times. “Li” basically means “interest” (“利”), including economic interest. This is a new initiative of Xi Jinping in promoting China’s economic diplomacy vis-a-vis developing countries. This new Yi Li combination requires China’s economic diplomacy to give priority to “Yi” when it comes to relations with developing countries. From the above, we can infer that China’s efforts for regional cooperation are not just confined to FTAs. Rather, China is seeking an innovative way of regional cooperation, mainly in the form of community-building. It is emphasizing cultural and historical exchanges as much as transport linkages. China feels that this kind of regional cooperation would be softer, deeper, and easier for its neighbors to accept. This reflects a new approach with Chinese characteristics in economic regionalism, but it is too early to tell whether China’s new economic regionalism works. There are at least eight characteristics of China’s economic regionalism. First, China’s regionalism strategy took shape in the overall context of China’s rise. Therefore, China’s regionalism seeks mutual trust and mutual benefits, peaceful cooperation, and “not bothering any others and posing no threat to another country.”12 To a large extent, this strategy is a means to guarantee China’s peaceful rise. Second, sovereignty plays a relatively important role in China’s understanding of regionalism. That is to say, the ideas of nation-state and sovereignty figure heavily when China pursues regionalism. China seeks national rejuvenation, national reunification, political autonomy, and a set of grand objectives for achieving the rejuvenation of China as a great nation. So, China’s regionalism is different from that of Western Europe. Throughout the process of regional integration of Western Europe, the European countries, to some degree, agreed to share and pool sovereignty. China’s understanding of sovereignty has not reached that level. This raises a question about how far China would go along the line of regionalism. Third, China is somewhat prudent towards regionalism. It carefully chooses the right timing before it moves. For the moment, China talks more about being a proactive participant rather than a proactive leader. When participating in regional cooperation in East Asia, China respects the leading role played by ASEAN, seeking an active but not a dominant role in order to assuage the worries of neighboring countries about China’s rise. That being said, China strives to increase regional mutual confidence in preparing for the future leading role that China might be able to play. It remains to be seen which part may emerge as China’s “heartland” when China assumes Asia’s leading role—the Asia-Pacific region or Central Asia—the heartland of the Eurasian continent in Mackinder’s classic works. Fourth, China’s regionalism is characterized by gradualism and a step-by-step approach. In terms of China’s attitude towards regionalism, it is gradual, having evolved from a lukewarm attitude to active anticipation. Originally, China was seen as a revolutionary state, and now it has evolved into a major country in Asian integration. Gradualism was reflected in the scope of regional cooperation. China’s regionalism was earlier reflected in the area of economic and trade cooperation, which had spillover effects on security cooperation and boosted political mutual trust. Gradualism was also reflected geographically, i.e., China’s economic regionalism started first from East Asia then gradually deepened into Central Asia and Russia, and from the Eurasian continent into the Indian Ocean. And gradualism was reflected in the level of depth of regional cooperation. That is to say, light FTA-type integration gradually moved into the deeper level of community building. China’s regional identity has kept evolving. Before the 1990s, China did not emphasize its Asian identity and therefore was not involved much in Asian regional cooperation. The situation changed in the 1990s as China started to become integrated into Asian regional cooperation and stressed that is was a responsible major country in this region. Now in the era of Xi Jinping, China is promoting the idea of Asian community. The community-building efforts might help China have a clearer and stronger Asian identity. Sixth, China is adopting open regionalism14 China embraces other countries’ participation and supports intra- and inter-regional exchanges and cooperation. China does not seek the Monroe Doctrine in Asia. This is different from the regionalism traditionally adopted in Europe and in the United States before and between the two world wars. NAFTA, dominated by the United States, and now TPP and TTIP arguably make no contribution to open regionalism, given their high level of exclusiveness. Seventh, China’s regionalism strategy was seen as a very important mechanism for pressing for domestic reform and opening up. TPP, TTIP, the EU-Japan FTA, and other regional cooperation dominated by Western countries are actually creating external pressures for China’s domestic reform and opening up. Eighth, the new generation of China’s regionalism is characterized by new ideas proposed by Xi Jinping, such as building a community of common destiny and a community of common interest, the Silk Road Economic Belt, the Maritime Silk Road, and the new concept of morality-interest (Yi and Li). All these new initiatives reflect China’s increased attention to cultural and historical linkages with neighboring countries. China is trying to find soft power from history and civilizations and people-to-people exchanges. This is going to be a new perspective for China’s regionalism, and by doing that China is seeking renewed confidence integrating with Asia and creating its own Asian identity. As the world trading system enters into an era of “competitive interdependence”15 and increased rivalries among great powers in Asia, China is accelerating the pace of its own FTA negotiations and might come up with new ideas in response to the development of negotiations for TPP, TTIP, and the EU-Japan FTA. Therefore, it is worth discussing what actions China might take. 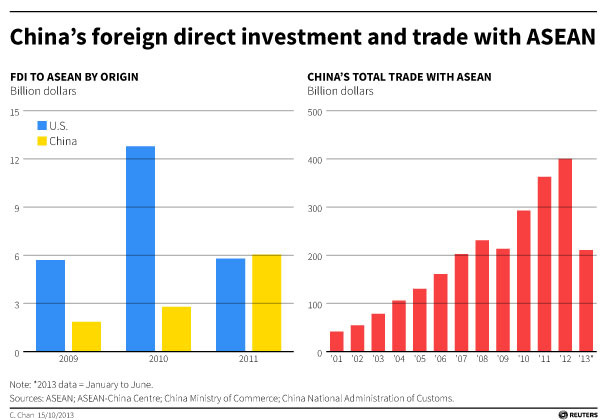 China is accelerating its pace at implementing its FTA strategy. In Asia, China has made it clear that FTA priorities are given to the China-Japan-Korea FTA, China-Australia FTA, and China’s FTA with Western Asia.16 RCEP now seems to be becoming another priority for China. With these many FTA negotiations being conducted at the same time, it seems that China is abandoning multilateralism and moving quickly towards bilateralism. However, the official rhetoric from Beijing does not support that view. One of China’s chief trade negotiators announced that China would adhere to a position where multilateralism is the main avenue of trade while regional (bilateral) trade arrangements remain complementary.17 As China’s former WTO ambassador Sun Zhenyu commented, “[t]he pendulum of trade liberalization might swing back to multilateralism at the end of the day.”18 He suggested, “The regional trade arrangements that we are now discussing might be multilateralized and it is necessary to agree on a set of multilateral rules for governing various regional arrangements.”19 For many Chinese trade veterans, it is impossible to give up the WTO as China is one of the biggest beneficiaries of the WTO. They fought hard to make China join the WTO, and it is unthinkable to turn away from it now. Then what are the possible explanations for the gap between China’s official rhetoric and its actual deeds? At least two explanations are available. One is that China is responding to competing pressure resulting from the FTA adventures of the Western powers, including Europe, the United States, and Japan. Given the potential “trade diversion effects” and loss of rule-setting power, China has to accelerate its own FTA efforts as a precautionary move. The typical example is China’s interest in signing a FTA with the EU.20 Moreover, an FTA between China and the United States has been suggested by some business leaders and former senior officials in both states.21 Although it is far from certain, we can still predict that some Chinese policymakers and intellectuals are thinking of using the FTA with major economies, such as the EU and the United States, to offset the potential negative effects of the TPP and the TTIP on China. The second explanation is that China is using FTAs as geostrategic tools to consolidate its influence in the Asia-Pacific region, as indicated by the negotiation of the FTAs with Japan and Korea, Australia, and the Gulf Cooperation Council. With those factors in mind, China probably will continue to build its trade policies on two pillars—multilateralism and regionalism. Priority might be given to regionalism as the Doha Round is not showing any sign of revival. That being said, China prefers not to leave the world with the impression that China has given up on the Doha Round. The Chinese government has repeatedly stated that it adopts open and inclusive regionalism, by which it tries to differentiate itself from the practices of NAFTA and the TPP, since the latter sets a high entry threshold. Since Xi Jinping came to power, he has proposed a series of ideas including the two silk roads as well as the new “Yi and Li” concept. These new ideas emphasize the openness and inclusiveness of regionalism, which are open to participation by all the countries along the Silk Road as well as all the developing countries in China’s neighborhood. Moreover, China’s regionalism is featuring historical and cultural bonds. China is trying to find its place through emphasizing those links. Although this kind of emphasis on historical and cultural bonds might set a cultural threshold for entry into the Asian community, this cultural and historical based exclusiveness should not be exaggerated, as China was among the first countries to embrace the membership of the United States and Russia in the East Asia Summit. In other words, China is fully aware and respectful of the historical presence of great powers in this region. The US Asia pivot and China’s renewed assertiveness in regionalism put the US-China relationship to the test. This might have some negative impact on East Asia integration, not to mention China’s territorial disputes with several Asian neighbors. So China needs to balance carefully between inclusiveness and exclusiveness in its regionalism, and seek regional harmony through building its own regional identity and constructing an Asian community. In the future, China needs to accept the fact that those countries that come from outside this region would have a place in Asia, and that it is appropriate to further advance international exchanges and cooperation with them, and find a delicate balance among great powers within this region. Further reform or turning inward? The multiple FTA negotiations in the Asia-Pacific region are now creating increasing external pressure on China’s domestic economic reform and opening-up. The timing is opportune, considering the arrival of a new generation of leadership that is more reform-minded. A good example is the fact that Li Keqiang took credit for launching the China-Switzerland FTA when he was vice premier and for concluding the FTA during his first trip in Europe in May 2013 after assuming the premiership. China is now even pushing the launch of a big FTA with the European Union. Faced with the options of RCEP, the China-Korea-Japan FTA, or TPP, it seems that China currently would rank order its preferences as China-Korea FTA, RCEP, and finally TPP. The China-Japan-Korea FTA used to be a priority, but given the territorial disputes between China and Japan and between Korea and Japan, the CJK FTA could not be advanced in a significant way in the near future. The bigger question now facing China is whether to join the camp led by the United States, the EU, and Japan, or to establish its own camp of regional economic integration. China now seems to prefer the latter, but whether it could succeed in a China-Korea-Japan FTA and RCEP remains uncertain. The variables include China’s capacity, political will, and interactions with other negotiating parties, in particular Japan and the United States in the background. It is equally fundamental whether the Chinese government could garner sufficient domestic support for pushing through big FTAs and whether China’s reformers could establish a convincing linkage between external pressure induced by the above-mentioned mega-FTAs and China’s own domestic reform agenda. 1. Chinese Foreign Ministry Spokesperson Qin Gang, Regular Press Conference of Chinese Ministry of Foreign Affairs on April 28, 2014, http://www.fmprc.gov.cn/mfa_eng/xwfw_665399/s2510_665401/t1150921.shtml. 2. On September 12, 1997, in the 15th Party Congress Report, Jiang Zemin asserted that China should take an active part in multilateral diplomatic activities and give full play to its role in the UN and other international organizations. 3. Li Yifang, “Lun Zhongguo yu Dongmeng guanxi de yanbian,” Jingzhou shifan daxue xuebao, no. 3 (2000): 73. 4. See Jiang’s speech “Deepen the solidarity and cooperation and create a bright century” at the inaugural meeting of the SCO on June 15, 2001, http://news.xinhuanet.com/ziliao/2002-06/05/content_425593.htm. 5. See Jiang’s speech “Strengthen unity and cooperation in Asia and promote world peace and development” at the 35th annual meeting of the Asian Development Bank council. 6. At the third foreign ministers’ meeting of Asian cooperation dialogue on June 23, 2004, Wen Jiabao’s speech offered proposals for promoting Asian cooperation, http://news.sina.com.cn/o/2004-06-23/02202879943s.shtml. 7. On June 7, 2013, Xi Jinping met with Barack Obama in California and mentioned that the “broad Pacific has enough room for China and the US,” http://www.chinanews.com/gn/2013/06-08/4909984.shtml. 8. “Establish the idea of community of destiny firmly.” On April 7, 2013, Xi Jinping released a signal of peaceful development at the annual meeting of the Bo’ao Forum. 10. Li Keqiang stressed ‘pave the maritime silk route for the ASEAN nations and make the strategic fulcrum to drive the development of the hinterland,” http://news.xinhuanet.com/fortune/2013-09/04/c_117231517.htm. 11. Xi Jinping, “Speech at the College of Europe, Bruges,” April 1, 2014, http://www.fmprc.gov.cn/mfa_eng/topics_665678/xjpzxcxdsjhaqhfbfwhlfgdgblshlhgjkezzzbomzb_666590/t1144230.shtml. 12. On December 14, 2005, the first East Asia Summit was held in Kuala Lumpur with 16 states in attendance. Wen Jiabao gave a speech entitled “adhere to the open and inclusive to achieve mutually beneficial win-win,” stressing that “China will continue to firmly pursue the principle of being friendly with its neighborhood and keeping company with neighbors and the policy of bringing harmony, security, and prosperity to neighbors.” China will never seek dominant status in this area. The development of China will not interfere with anyone. It will pose no threat to any country. 13. Xiao Huanrong, “Zhongguo de daguo zeren yu diquzhuyi zhanlue,” Shijie jingji yu zhengzhi, no. 1 (2003): 48-49. 14. At the 2014 Bo’ao Forum for Asia, there was a sub-forum on “the revival of the Silk Road: dialogue with Asian leaders,” where State Councilor Yang Jiechi said that Asian countries should enhance mutual trust, adhere to open regionalism. See: http://money.163.com/14/0410/14/9PFQPFBE002551CN.html. 15. A. Sbragia, “The EU, the US, and Trade Policy: Competitive Interdependence in the Management of Globalization,” Journal of European Public Policy 17, no. 3 (2010): 368-382. 16. Yu Jianhua, “Speech by Yu Jianhua, Deputy China International Trade Representative at Bo’ao Forum,” June 20, 2013, http://finance.sina.com.cn/hy/20130620/092015853900.shtml. 17. Yu Jianhua, “Zimao ou tanpan fang ying Zunzhong gefang hua yu quan,” June 20, 2013, http://finance.sina.com.cn/hy/20130620/092015853900.shtml. 18. Sun Zhenyu, “Speech by Sun Zhenyu, Former Chinese Ambassador to the WTO at Bo’ao Forum,” June 20, 2013, http://finance.sina.com.cn/hy/20130620/160015859290.shtml. 20. Wen Jiabao had proposed a FTA feasibility study with the EU at the China-EU summit in 2012. See Xinhua News Agency, “Foreign Minister Yang Jiechi Briefed about Premier Wen Jiabao’s Visit in Brussels for the 15th EU-China Summit,” September 21 2012, http://www.gov.cn/jrzg/2012-09/21/content_2230338.htm. 21. The Joint Statement of the 4th Annual US-China CEO and Former Senior Officials’ Dialogue suggested a US-China FTA. See China Daily, “Fourth Annual US-China CEO and Former Senior Officials’ Dialogue Concludes in Beijing,” June 5, 2013, http://www.chinadaily.com.cn/china/2013-06/05/content_16571993.htm.